ISO 11783 (or ISOBUS) is a J1939-based CAN protocol for communication in the agriculture industry. ISOBUS is a CAN-based multimaster network whose protocol has been harmonized with J1939. This means that both systems may be used in parallel in the same network or segment. CANoe.ISO11783 is suitable for the design, diagnostics, and testing of ISO11783-based networks and components. CANoe.ISO11783 gives the user an optimal tool that can be used from development to end-of-line testing. Support of ISO 11783 standard allows the user to analyze and simulate complex communication structures easily and efficiently. 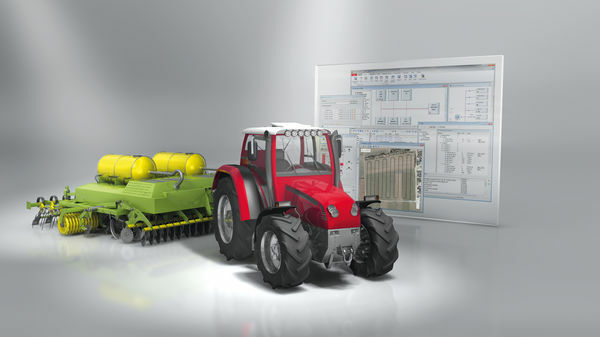 Main components of an ISO 11783 network are delivered by provision of examples such as Virtual Terminal (VT), Task Controller(TC), Auxiiliary Inputs , Tractor ECU and File Server. Thanks to a comfortable programming interface, no detailed knowledge of the ISO11783 specification is necessary for the test development. Extended DBC database with ISO11783-specific PGs such as VT12 / VT21, PD, TIM12 / TIM21, AUTH12/AUTH21, FSC / CFS etc. CANoe .ISO11783 allows the user to monitor communication on the symbolic level in a Trace window, where the parameter groups transmitted are displayed. All relevant information is output in separate columns, such as the parameter group number, priority, source and destination addresses as well as protocol interpretation in text form. Individual subject areas such as transport protocols, network management and diagnostics are color coded. In particular, highlighting of protocol violations help to assure ISO11783-conformant communication. Additional functions such as the topic-based analysis filter, context search and the column filters of the Trace window make it easier to find specific parameter groups. With use of the ISO11783 option, protocol-specific information can be displayed in the Trace Window. Analysis filters are available for the specialized analysis of protocol ranges. These filters can be configured as Pass or Stop Filters. The context search feature makes it easy to navigate between the messages of a channel in the Trace Window (sequential mode). The GNSS Monitor is used for the graphical and numerical display of longitude and latitude, as well as the elevation of a GNSS message of the NMEA2000® or J1939 protocol. The simulation of individual attachments is simplified greatly through specific functionality. The different network nodes are simulated by the ISO11783 interaction layer based on the communication relationships in the database. This means that the network management, the transfer of the object pool to the VT and the transfer of the device description to the task controller are already taken care of – without a single line of code. Measurement data requested by the task controller is also provided automatically by the interaction layer. For further functions, such as application-specific processing of user input via the VT, there is a ISO11783 library for the CAPL programming language available. a Virtual Terminal Interaction Layer (VT_IL) implemented as a software library. Great importance was placed on the flexible description of the terminal properties. For example, the user can configure the simulated terminal so that it supports a color or black and white display. The number of “Soft Keys” and the screen resolution are also freely configurable. User-defined “user layout” masks can be displayed simultaneously, as can the masks of the different working sets. With this tool, the user can test all terminal variants and operating concepts in practical situations. Besides its use for pure simulation, the VT Window or rather VT_IL can also be run passively in the network as a reference. In this case, the CANoe Virtual Terminal does not actively participate in CAN communication, rather it listens to the communication between an implement device and the real terminal. This makes it easy to reveal compatibility problems of the real VT quickly. In addition, the passive VT operating mode is well-suited to the analysis of previously recorded bus traffic. Problems in communication can be visualized immediately using the CANoe VT, simply by playing back a log file. This simplifies the time-consuming analysis of the CAN data traffic and its potential effects on the application level. Specialized filters and intelligent interpretation in the trace window enable a clear and informative presentation of the message flow. an easy-to-use interactive Task Controller (ITC). Both variants (TC_IL and ITC) provide easy access to the individual process data of any implement. The process variables are displayed as physical values. Beyond that for implement control various tasks can be defined which can be activated as needed. You can also set up the peer control assignments. If available CANoe can import standardized device description files based on XML to query implement information or receive it directly from the implement via CAN. Like VT_IL and VT Window, ITC and TC_IL can also run passively on the network. This has the same benefits, such as the detection of compatibility issues in an active network or during logging file replay. The ITC variant has a graphical user interface and allows the simulation of a Task Controller without any programming skills. Thanks to the comfortable API, the TC_IL variant allows an individual adaptation of the simulation to the respective requirements and a simple integration into an automated test environment. CANoe .ISO11783 provides several libraries with which each ISOBUS-relevant component can be simulated. All these libraries can be easily integrated into a test environment (such as vTESTstudio). Thanks to a comfortable programming interface, no detailed knowledge of the ISO11783 specification is necessary for the test development. From the individual test cases, any complex tests can be compiled. Test results are presented in a clear way, causes of the failure are explained in detail. To cover the test scenarios defined in the new J1939-82 Compliance document (release 2015), a Test Unit is provided, which is created using vTESTstudio and a specialized window. All data relevant for test execution are conveniently managed directly in the window J1939.CT_Configurator provided for this purpose. Detailed and exact test protocols provide a clear overview of the test procedure and results, which considerably simplifies subsequent error analysis. The J1939 XML Test Module Manager supports the user in preparing complex tests based on the CANoe XML Test Feature Set. These tests can be implemented very quickly with CANoe and without programming effort. Many test cases are available specifically for J1939 applications, and the manager can be used to select and configure them. Especially the tests described in the SAE J1939-82 (Compliance) document from 2008 are considered.. Detailed fault notifications simplify the analysis of failed test cases. The components DTC Monitor and Diagnostic Memory Accesswindow make it easy to work with the diagnostic protocol defined in ISO 11783-12. With the DTC Monitor in the Measurement Setup you can easily display and request error codes (DTC – Diagnostic Trouble Codes) and diagnostic messages. With the support of Freeze Frames (extended information from fault memory) you can use the DTC Monitor for emission related or power train diagnostics. With the Diagnostic Memory Access (DiagMemAcc) in the Measurement Setup you can read and write parts of the memory as well as execute a boot load procedure. For this the diagnostic messages DM14, DM15, DM16, and DM18 are used. For OEM-specific diagnostic protocols, the Diagnostic Feature Set (KWP2000 and UDS) is available. This enables support of networks with dynamic ECU addresses as well. With the use of this protocols CANoe.ISO11783 can reassemble the individual fragments. Communication is monitored for errors during measurement and, if necessary, warnings are output. Protocol interpretation is limited to the channel the user configured as ISO 11783. Gateway solutions with various protocols can thus be monitored easily. Display of 29 and 11 bit CAN identifiers is supported at the same time. ISO 11783 parameter groups and signals are described in a database, which already contains predefined standard objects that serve as examples. The user can expand the database using the CANdb++ editor (included with delivery). This makes it possible to define application-specific parameter groups (Proprietary PGs), for example. The CANdb++ Editor was specially extended for use in the ISO-11783 environment with dialogs and additional views to make creation and verification considerably easier for the user. Parameter groups and signals thus defined can be selected symbolically in the entire program. CANdb++ Editor: Data management program for creating and modifying ISO 11783 databases. Don't feel like reading? Then take a look at the videos. Learn to know how to simulate and test ISOBUS components like implement, Virtual Terminal and Task Controller. CANoe .ISO11783 provides a variety of possibilities for simulating, developing and testing ISO11783 systems. But only those who are familiar with these options can fully tap the potential and save time and money. Benefit from our training and education offers in order to use CANoe .ISO11783 even more efficiently in your daily work!